Independent and adventurous aptly describe Bhikkhuni Poosirivara who after graduating from Thammasat University in Thailand went on the USA to work and study for her Master’s Degree. Eventually, she married and bore two children: a girl and a boy. Yet, she felt that something was missing. A deep integration began when she listened to Dhamma teachings and practiced vipassana meditation at a Thai temple in St. Louis, Missiouri. She felt as if she were coming home. After 26 years of living in the USA she decided to return to her homeland of Thailand. 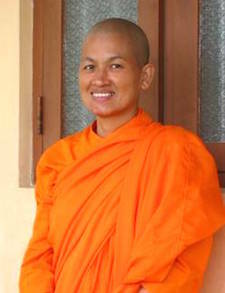 She ordained as a Samaneri and then as a Bhikkhuni and she found a deep purpose in life of serving Buddhism. Now she is building a meditation retreat center and a Dhamma training center for youths. A dream is coming true as she builds, Suan Siri Dhamma Center in Chacherngsow Province, Thailand.